The Mid() function returns substring from a string and size of the substring is decided based on the parameters provided. 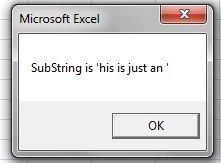 Substring will be returned from this main string. Starting position of a substring, if start > No Of characters in main string then Mid() will return zero-length string(“”). No of characters to be taken from the starting position. If not provided, all the characters after starting position are taken. strMainString = "This is just an example"
MsgBox "SubString is '" & Mid(strMainString, 2, 15) & "'"
218 queries in 0.091 seconds.